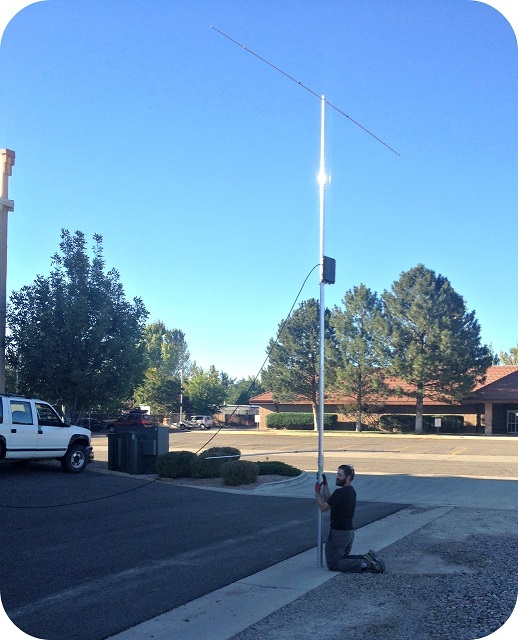 High Performance, Ultra-Rugged 30m Through 10m 6 Band (With Feedpoint Mounted ATU) Vertical Dipole Under 16 Feet Tall! No Radials! Force 12’s Sigma Series Verticals are contest and DXpedition proven winners! The vertical dipole design means high efficiency even over poor ground. A vertical dipole will generally have a lower radiation angle and higher gain than a ground plane vertical mounted at the same height and achieves this with no ground radials. The “T-Bars” at the top and bottom of the Sigma define the compact but highly efficient design. The SIGMA 3010 HD is a version of the heavy duty 20m Sigma vertical adapted for multi-band use with an autotuner (ATU) installed at the feedpoint and which works very well on all bands 10 through 30 MHz (30, 20, 17, 15, 12 and 10 meters) with lesser performance on 7 and 50 MHz (40 and 6 meters). The feedpoint is the most efficient place to locate an ATU – every foot of coax between your antenna and your ATU adds loss to the system when high VSWR is present on the feedline – and we offer two popular MFJ “Intellituner” ATUs which we have tested to work well with Sigma verticals and for which we have designed rugged feedpoint mounts. The MFJ ATU circuitry is powered by DC power sent down the coax via a bias tee so no separate control lines are required. Alternatively, you can supply your own remote – or desktop – ATU to use with your SIGMA 3010 HD. The 4 foot mounting height (measured at the base insulator) works well however the SIGMA 3010 HD will also work well mounted lower or higher including rooftop mounting. Higher mounting will lower the radiation angle. This is nothing like some of the flimsy verticals out there in the ham market – it’s a tank! All of Force 12’s Sigma verticals are heavy duty and this model is ultra-HD with 2.750 inch OD diameter aircraft grade aluminum tubing tapering to 2.000″ OD for the vertical section with a sold fiberglass section at the feed and tapered 0.750 to 0.500 inch T-bars. This rugged antenna is completely self-supporting, no guy wires needed. As with all Force 12 antennas, all hardware is stainless steel including the ATU mounting hardware. The SIGMA 3010 HD is 15.5 feet tall not counting the included 4 foot long 2.750 inch OD base which extends below a 2 inch wide solid fiberglass base insulator. Every vertical antenna should be used with a feedline choke and we recommend the choke in the case of the Sigma ATU models be mounted as close to possible at the ATU input (assumes the ATU is mounted at the Sigma feedpoint). The feedline should be run perpendicular to the antenna at a 45 degree or greater angle to minimize coupling. Your perforrmance may vary somewhat depending on your ground, mounting height and other environmental factors. Note that MFJ does not recommend transmitting via their Intellituners when the matched VSWR > 1.5:1. When you order a MFJ Intellituner with a Force 12 Sigma Series vertical, Flagpole Antenna or InnovAntennas 33V Vertical Ground Plane we include the heavy duty feedpoint mounting bracket free (all stainless steel hardware).